Okay, sounds good, so let’s go get the right people and everything else will be great. Then we will not need to keep the wrong people and instead, we will need to grow those that have potential. The problem with all this is that we are talking about people and when we do that, we have a lot of other factors that get in the way. Emotions are the big one, but also best intentions. You want to see the best in people, and you want to help others. These all have an influence in working to get the right team in place. I have experienced this repeatedly, and have felt it in my gut when I knew I had the wrong person in the wrong seat and, given whatever circumstances, don’t make a change right away. I was reminded of this by a recent blog that was written by my friend, Stephen Lynch. Stephen has written a book, Business Execution for Results, that is a great step-by-step for getting the strategic plan, the alignment, the key decisions and the execution all down, so your business is spinning like a top. 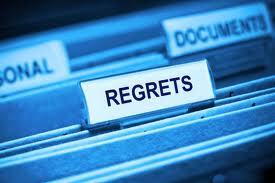 The blog he sent me was called “The #1 Regret of Business Owners.” And guess what that one regret is? Hiring mistakes! As we just discussed, it’s all about the people. Stephen says that sometimes it is good performers who don’t fit into your culture. Other times, it is taking too much time to fix performance issues with someone that fits in, but is not achieving the desired result. Then there are the times we just hire the first person with a pulse to get it out of the way. There is no perfect way to find people because, as we said, we are dealing with the complexity of humans and boy oh boy, can we be filled with intricacies. At Efficience, we have had success with process called Topgrading. It has helped us find good people, but sometimes we just have had them in the wrong seats. It may take some learning, as we have experienced, but we finally found two technical project managers that are knocking it out of the park! Thank you Chris and Sarah for great results in getting our projects done and making our clients happy! Peter Drucker, in his very interesting book, Post-Capitalist Society, tells us why people are so important. The book is all about the societal transformation from capital, land and labor, to a knowledgeable society where individuals are central. We can see with this explanation from Drucker how important our people are, and getting the right ones on board and in the right seat is job number one for any leader! Do you have the right people sitting in the right seats?